Battle Tactics: Plan before you program! When the programming battle begins, you’ll need a plan of attack before you actually start programming your solution. Here are some tips to help you plan your program. Try to explain it to your teammates. The better you understand the challenge, the easier it will be to create a solution. Look at the keywords in the problem again. Think of the end user. Who will be the users of the app? What are the end users problems? What do the end users needto be able to do? Optional: What would be useful for the end users to be able to do? Great! You have an idea of what you’re going to make and its features. How will you implement it? Think about your tools. Remember, you have a limited number of time to develop your solution. 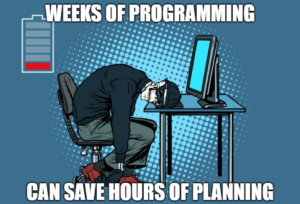 Try to plan your work over the period of time. What will you do first? Start on the basic features. After you’ve planned your timeline, determine if you have time to develop all the features you’ve come decided on. If not, leave out nonessential features.